It would have been difficult, though not impossible, for another club to have been made Branch Club of the Year following the success of the Albatross RAFA Club of Bexhill in the national competition, (a feat well documented in previous issues of the Sussex Drinker), and given that it was such a clear winner in the previous branch competition. Sure enough it was the 2016 branch Club of the Year and went on again to win the Sussex and regional awards, congratulations once again to head bar steward, Karen Pelham, and her staff. The Club progressed through the Super-Regional round to reach the national top four once more. The presentations for the Branch, Sussex and Regional awards all took place on an evening in January 2017 at the Club. 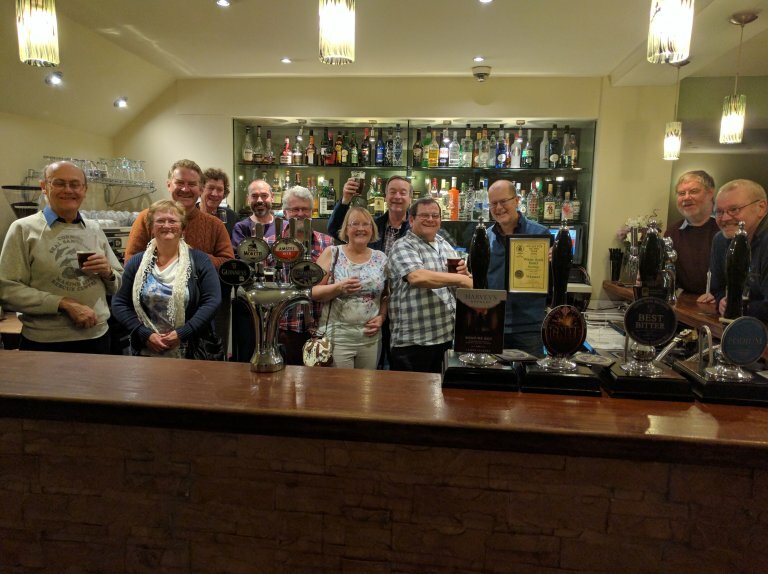 Behind the bar of the Club are left to right: Peter Page-Mitchell, Sussex Area Organiser; Chris Stringer, Regional Director; Karen Pelham, Head Steward; Jenny Phelan, Steward and Peter Adams, Branch Chair. The other awards which provide a passport to Sussex competitions and maybe further were also won in 2016 by the 2015 winner. 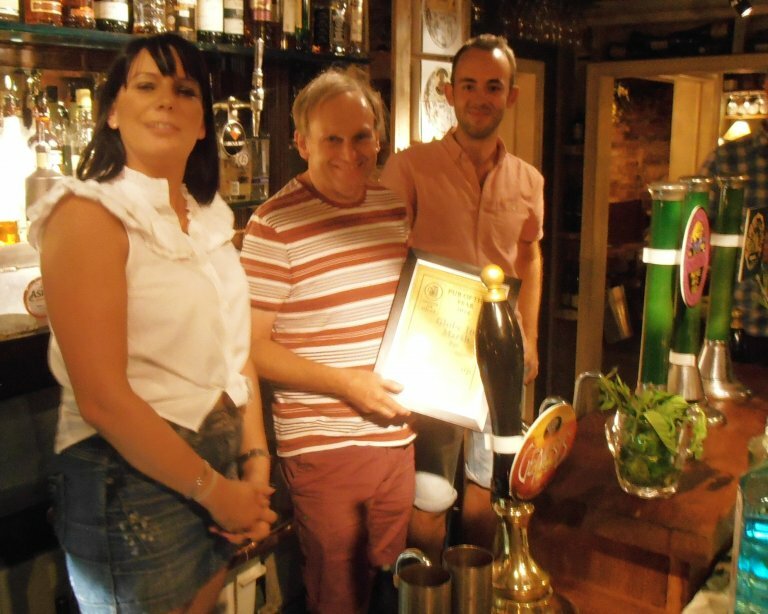 The Tower in St. Leonards won both the Branch Pub of the Year and Cider & Perry Pub of the Year. This pub is a favourite as it stocks up to six real ales, two from Dark Star and four ever changing from a good variety of breweries, including local ones, and sells them at competitive prices. Its cider credentials are good too, selling up to six in a good range of styles. In addition it has the feel of a traditional pub, but brought up to date by showing plenty of sport on multiple screens. The picture shows proprietor Louisa Gover behind her bar with Branch Chair Peter Adams at the presentation at the pub in June. 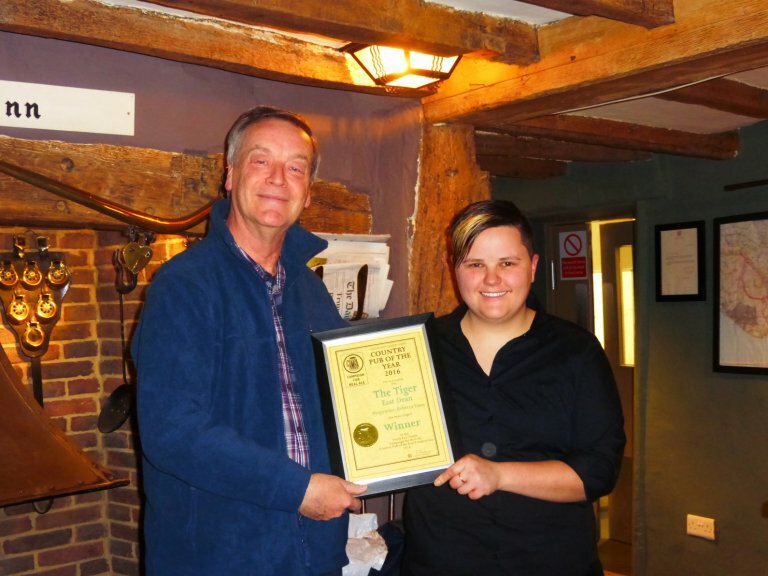 For the first time in 2016 the Branch awarded a runner’s up Pub of the Year certificate, with the Globe Inn Marsh, Rye gaining that spot well ahead of the third placed pub. This was the first CAMRA award for the Globe in its first year in the Good Beer Guide, apart from an appearance back in 1977 when the pub was very different. It is part of a small local pub chain, Ramblinns, with all its pubs are in south east Sussex or south west Kent. Two house beers are brewed for Ramblinns by Tonbridge Brewery and the Globe has three other local brews on offer. It is a creatively designed and furnished, food orientated pub with a unique open plan bar, with the beers complemented by a selection of real ciders. The picture shows the presentation being made to Julie and Thomas, representing Ramblinns. 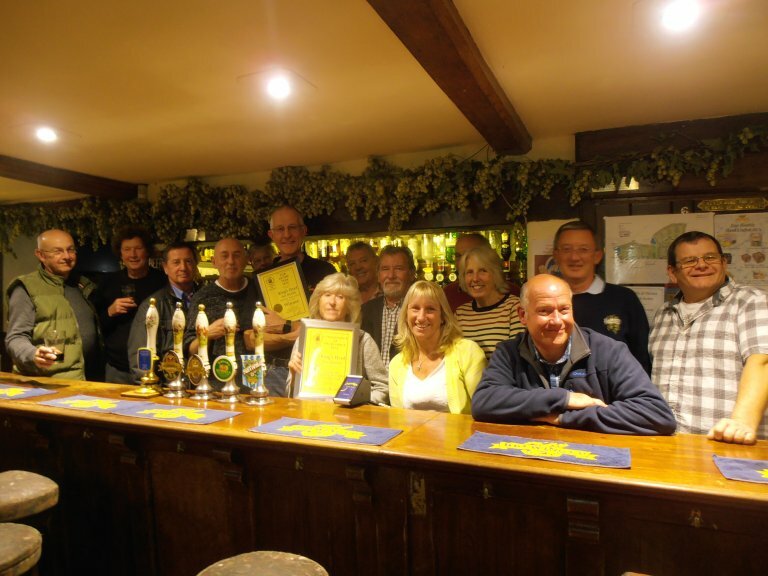 Another first was the North East Sussex Sub Branch’s awarding its Pub of the Year to the King’s Head, East Hoathly. 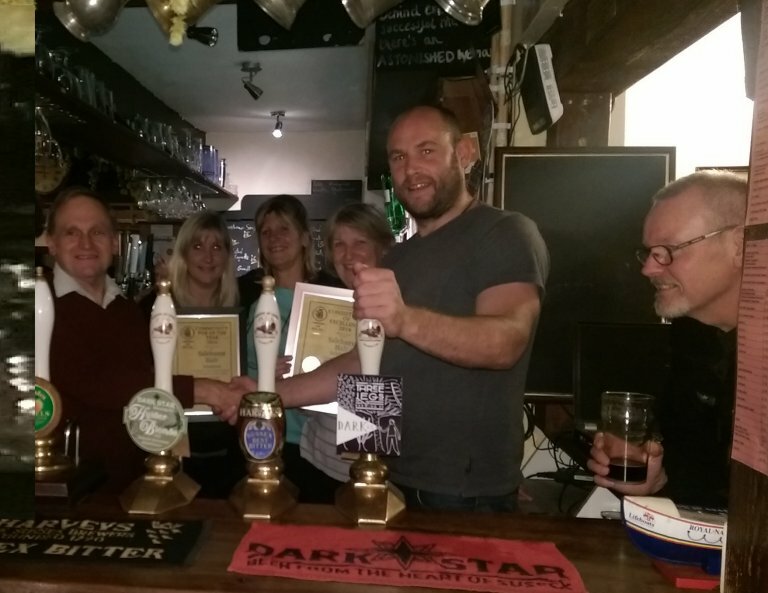 On the same evening the proprietors Robert and Tracie were also awarded a certificate to mark ten consecutive years in the Good Beer Guide with the publication of the 2017 edition. The pub is the brewery tap of the adjacent 1648 Brewery, but serves a guest beer as well. The building started life as the village school, but has been an inn since 1765. The first picture is John Packer, Chair of the Sub Branch, left, with Robert and Tracie. The second includes the gathered Camra members. No stranger to CAMRA awards, the White Rock Hotel, Hastings was Branch Pub of the Year in 2008, shortly after gaining its place in the Good Beer Guide, which it has maintained to date. Since then it was awarded LocAle Branch Pub of the Year in 2013 and 2014 and won the same in 2016. Owners Laurence and Lauren Bell started out with a policy of only stocking Sussex ales and this has continued from when the bar was given a complete make over and four handpumps to this day. There is always a range of beer styles available in this hotel bar which is attractively situated on the sea front, overlooking the renovated pier. 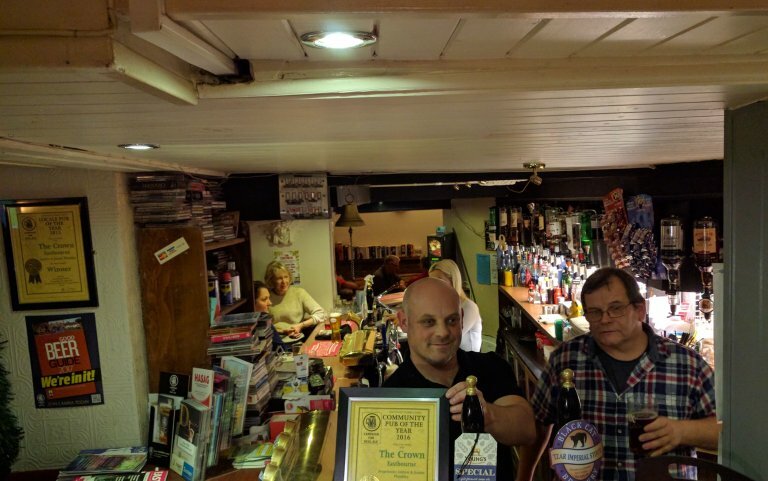 The first picture shows Branch Vice Chair, Phil Cozens (left) with Laurence behind his bar, the second also includes the various Camra members present. 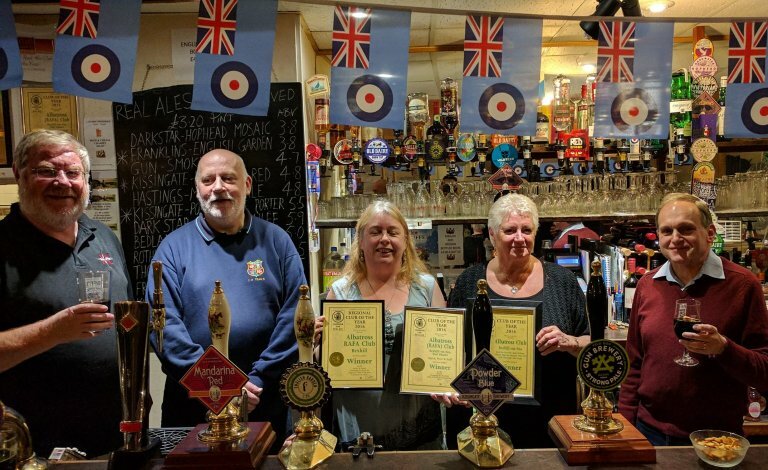 The CAMRA Branch was split down the middle in determining its Community Pub of the Year Award, and even when a run off was held between the top two pubs, the vote remained tied. One of these, the Crown in Eastbourne’s Old Town, had previously won the 2015 LocAle Pub of the Year in its first year in the Good Beer Guide. Proprietors Andrew and Joanna Plumbley run a pub with a large and loyal following from the local population. It is a cosy pub in the winter with two log fires and for the summer boasts the largest pub garden in Eastbourne. Its beer offering unusually in the area features four easily recognisable bitters, each with its loyal following amongst the regulars, these are supplemented by one or two guest beers, which are further augmented at beer festival time, which happens three times a year. Pictured is landlord Andrew (left) with the Branch Vice Chair. 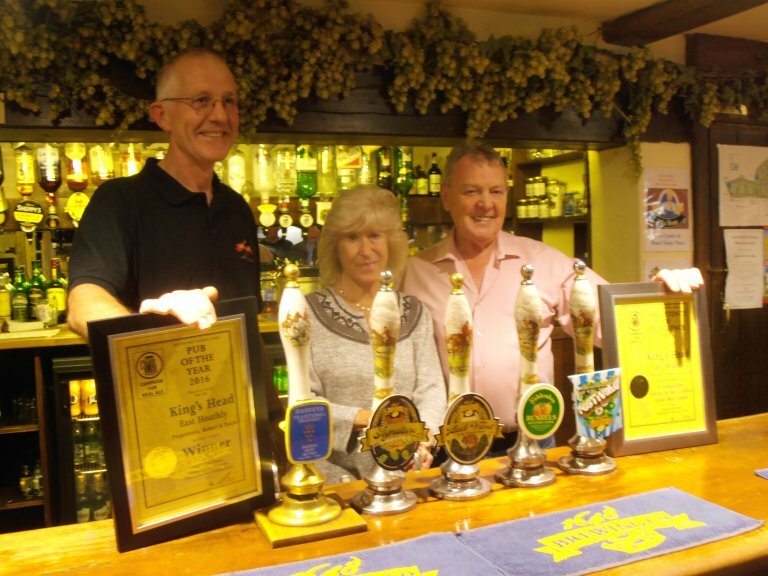 The other winning pub is a community rural pub, in complete contrast, with attractive views across the adjacent Rother Valley. 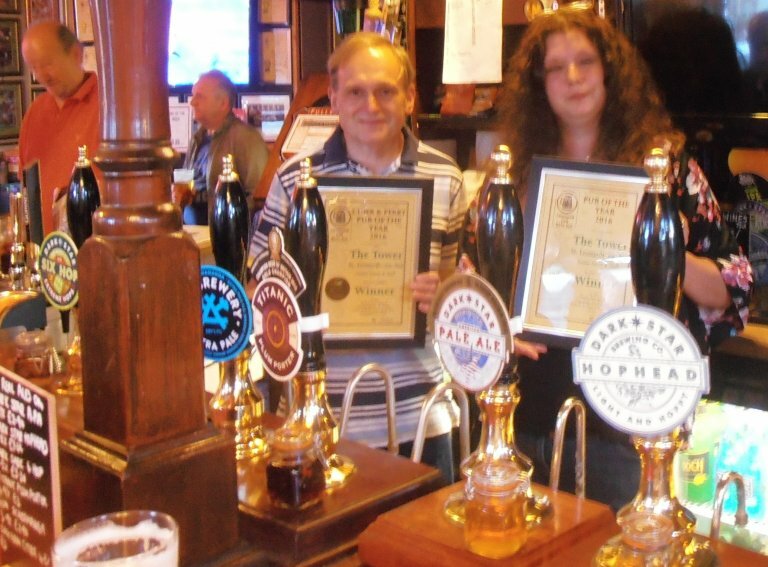 The Halt at Salehurst is also a previous CAMRA award winner, having been voted Country Pub of the Year in 2013 to the credit of proprietors Karen Collier-Keywood, Gail Augarde and Andrew Augarde who on the occasion of the 2016 presentation were also awarded a certificate for ten consecutive years in the Good Beer Guide. There are four handpumps of which one is dedicated to cider, while the beers show a strong local bias. This pub is also popular with locals, but with a smaller catchment than the Crown, attracts a loyal following of walkers and other visitors from a wider community. 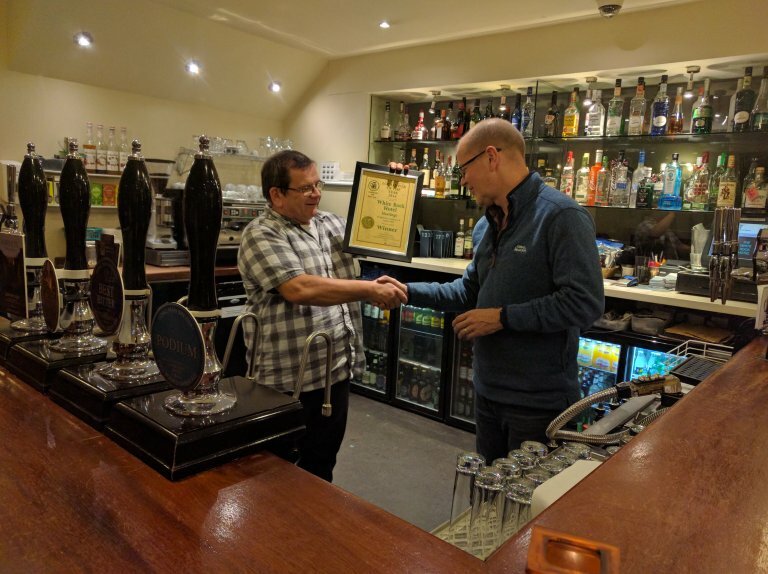 With both winner and runner up of the main competition being town pubs, this meant a Country Pub of the Year award was made to the Tiger at East Dean, the first award the Branch has made to this pub. Another brewery tap, this time for the Beachy Head brewery from the same village, the pub also features beers from larger neighbouring breweries, Harvey’s and Long Man, as well as other occasional guests. The pub is attractively set in one corner of the village green and in good weather patrons spill out across the grass. The picture shows branch committee member Paul Bangs making the award with proprietor Rebecca Vasey.